Aaron Shearer's Classic Guitar Technique is used by serious guitarists all over the world and has long been one of the definitive classic guitar methods. The Shearer Method: Classic Guitar Foundations, Shearer's final work, is the first in a series that encapsulates his lifetime experience as America's premier classic guitar pedagogue. This new work is a step-by-step curriculum based on Aaron's innovative and common sense approach that incorporates all the advantages of modern technology. The method includes 63 DVD videos for up-close aural and visual learning, 74 new solo and duet compositions and arrangements (made exclusively for this method by Dr. Alan Hirsh), as well as works by Sor, Carcassi, Giuliani, and more. Plus, recorded tracks masterfully illustrate nuance, tone, and musicality. The book even includes Alfred's exclusive TNT software that allows you to slow down and loop tracks for careful practice. In addition, a complete online supplement is available for teachers and students that want a deeper understanding of Shearer's work. The book does not replace Shearer's original classic. It augments and expands on it in ways not imaginable in the early '60s when the original was published. It's a must-have to complete the library of any classic or fingerstyle guitarist! 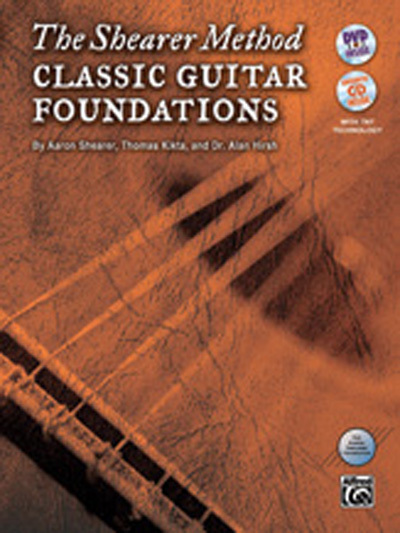 The Shearer Method Classic Guitar Foundations is not just a book but a media experience. When I purchased this book, I thought I was getting a traditional run of the mill beginning classic guitar book, but to my surprise I received much, much, more than a regular music book. I received the book, a dvd with video and play along music for almost every song in the book, an exceptional website, and a Supplement loaded with additional information. I still cannot believe what a powerfully organized package of materials I have received. The Shearer Method Books are worth every penny I spent. I cannot say that about many of the classic guitar books I own. I was so happy with this book that I purchased the next two books in the series. I must commend the makers of this series for putting out a quality product. I am truly impressed!